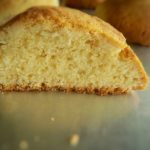 These vanilla cake-like cookies are very yummy and puffy! They are so easy to make. No chilling required! 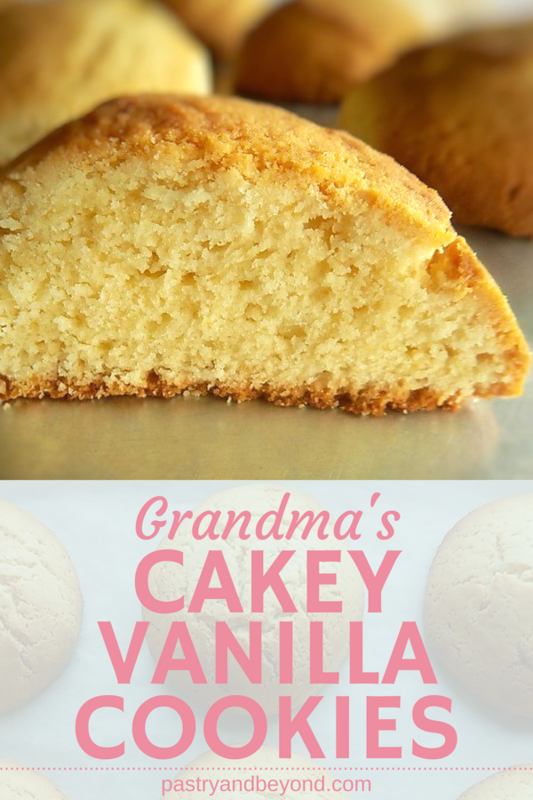 Welcome to my blog 🙂 In my first post, I want to share my grandmother’s puffy and yummy vanilla cookies. As a family-4 generation, we all love these cookies. 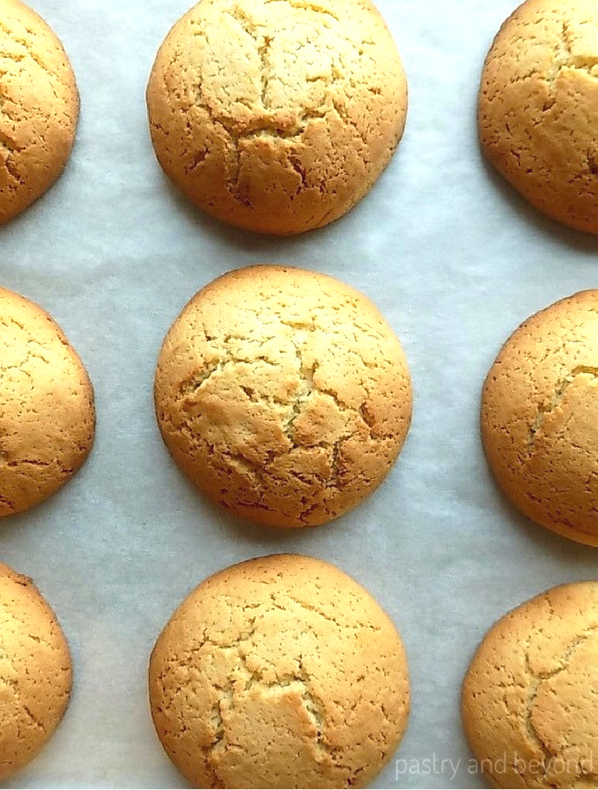 You can make them for your kids, for yourself, for anyone who likes puffy and cakey cookies. Recently I have made these cookies for my niece who is 8 and I have asked her if I share this recipe as my first post. She has agreed as they are one of her favorites and I take her comments seriously for sure. I believe you all love them if you like cakey cookies. Melted butter, olive oil, and yogurt are the ingredients that give some moisture to these cookies. Good news! 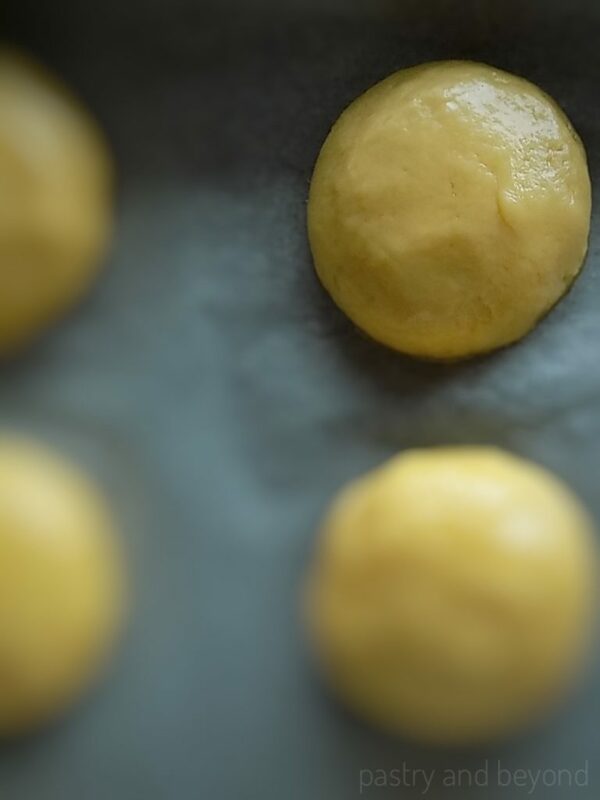 You don’t need a mixer and you can directly put them into the oven before resting the dough. It is always hard for me to rest the dough even for 30 minutes when I crave a cookie! Before going through the steps, I just want to say something about the measurements. I always prefer using a digital scale. Gram is always a gram but cup measurement is not as accurate as weight measurements. So if you use a scale we can all have the same results. Don’t worry! I use grams but I also add cup measurements in my recipes. First I melt the butter halfway and take it from the heat and stir until it is all melted. By this way, the butter will cool quickly. If we use hot melted butter, it will cook the eggs. 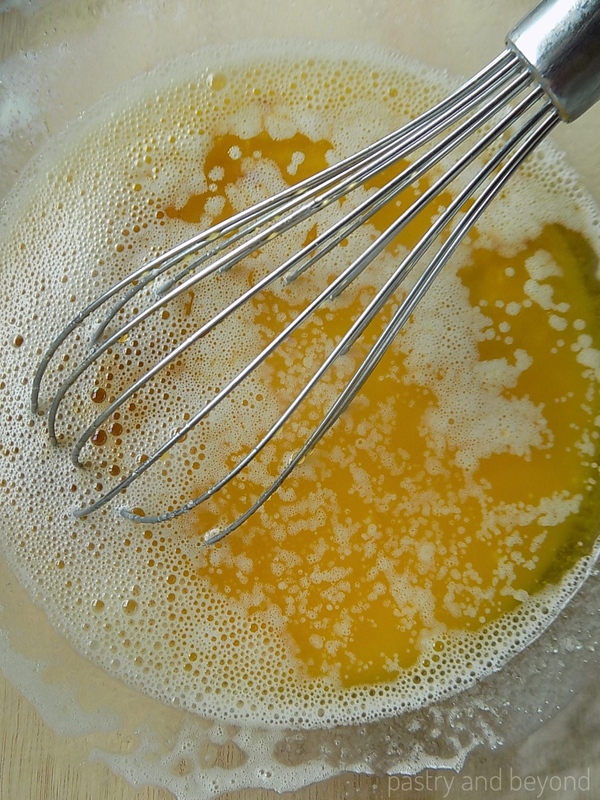 While I keep the melted butter aside, I whisk the sugar and eggs for 15 seconds or so till they are mixed. Then I add the yogurt and stir well. Later I add the olive oil, melted butter, vanilla and mix them until all combined well. Finally, I add the flour mixture in 3 batches and mix until all incorporated. The dough will be sticky. Below you can see the consistency from the picture. 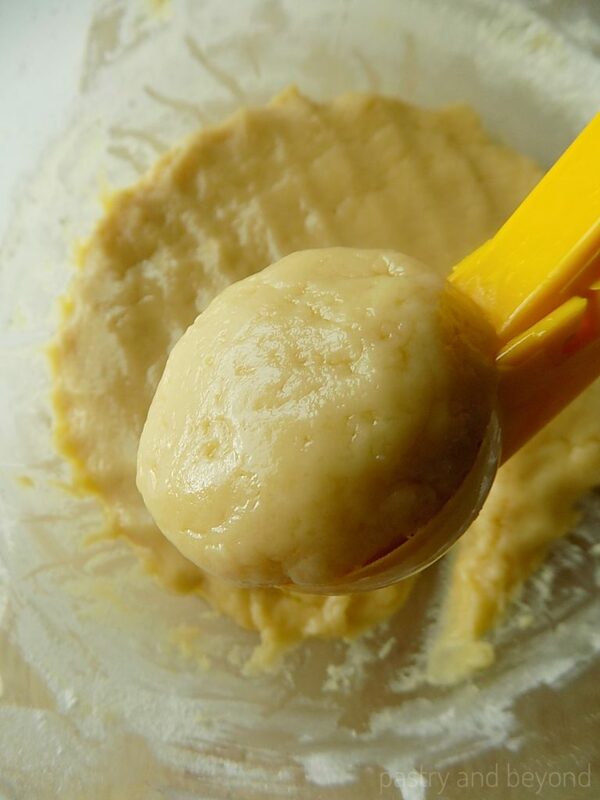 I advise you to use an ice cream scoop when rolling dough into balls as the dough is sticky. This is a big cookie so I use a big ice cream scoop which is 3 tablespoon big. If you don’t use a scale, you may have an idea about how much dough you need from the picture. I put more dough than it can take in the ice cream scoop -90 grams of dough per cookie. OR, as it makes 11 cookies, you can divide the dough equally into 11 pieces and roll them into balls. First I take the dough from the scoop and then I use my hands to roll it into a ball. I place it on the baking sheet. The dough, shaped into a ball will spread. It is how it should be. I repeat this step until no dough remains. It is really big so when you eat one cookie you will be full. 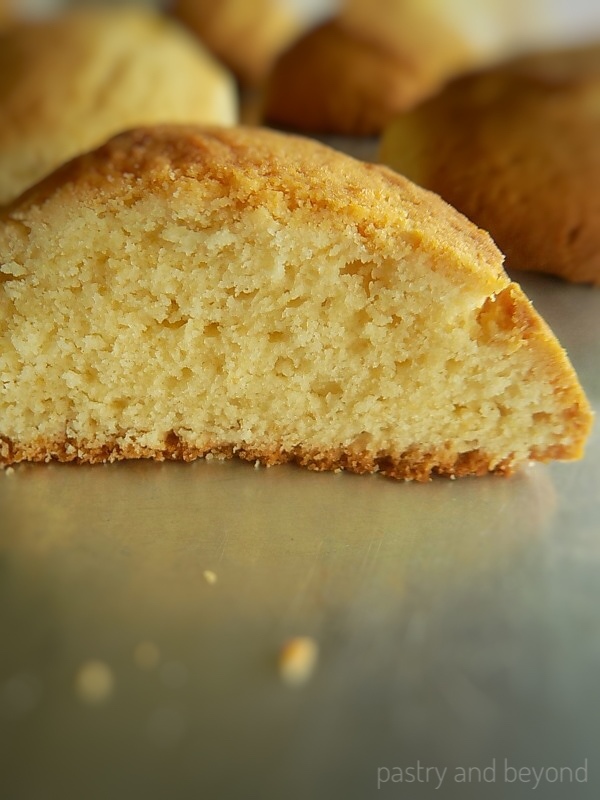 It takes almost 20 minutes to bake. When the cookies are lightly golden brown, you should take them from the oven so that they won’t be dry. Then let the cookies cool for 10 minutes on the baking sheet before transferring them to a wire rack to completely cool. 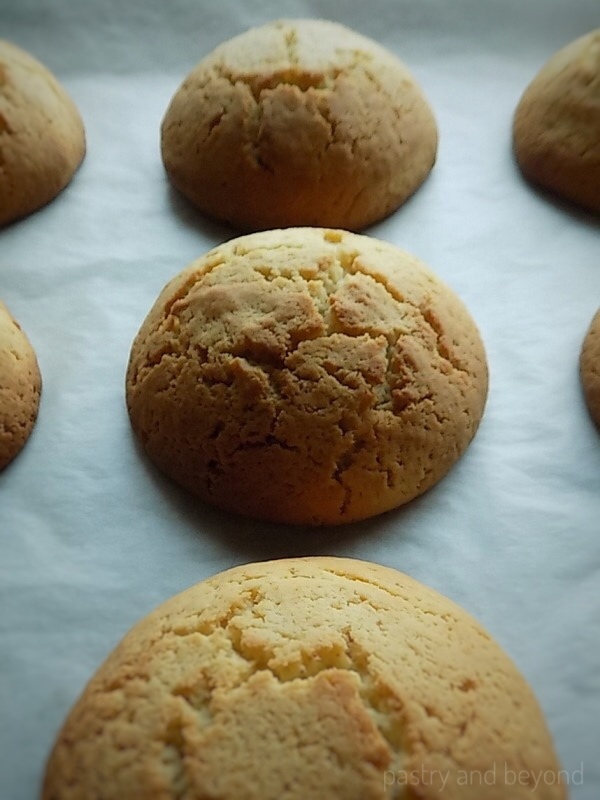 Hope you all like these vanilla cookies and make them often. If you like crunchy cookies, you should try my vanilla shortbread cookies that are dipped in white chocolate. 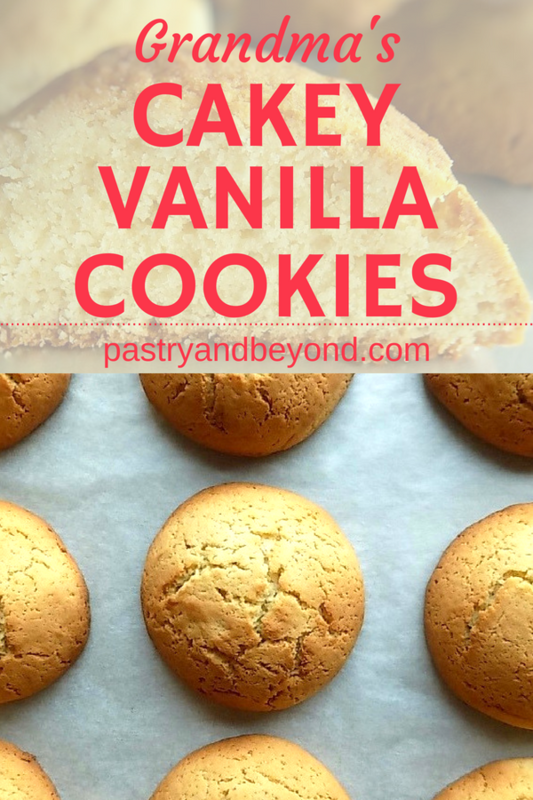 You should try this yummy vanilla cookie recipe if you love puffy, cakey cookies! No chilling required! Preheat the oven to 325°F(165C°). Line baking sheet with parchment paper or silicone baking mat. Set aside. 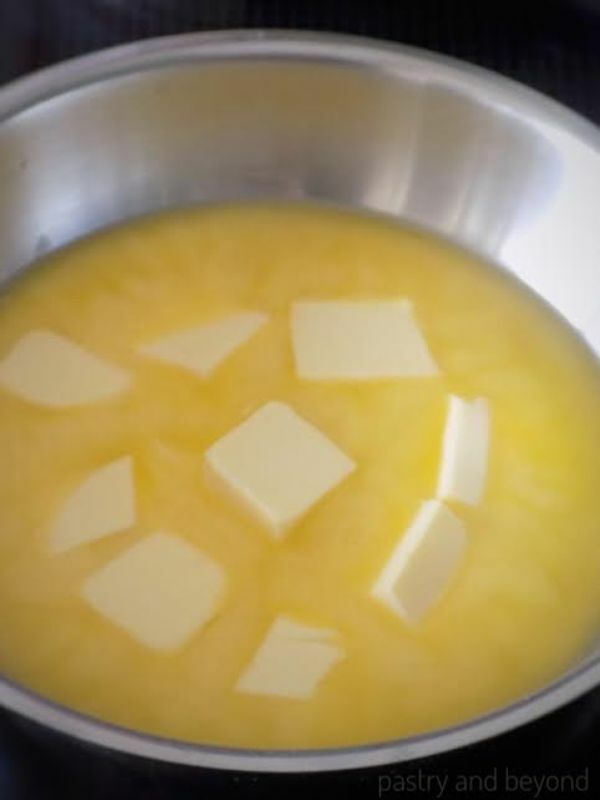 In a small saucepan melt the butter over medium heat until it is halfway melted. Take it from the heat and stir until it is all melted. Set aside. 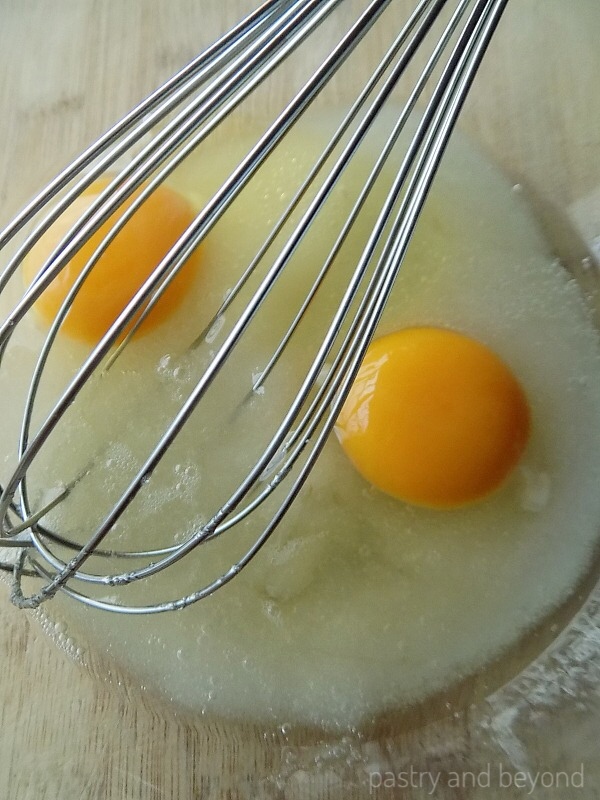 Put the eggs and sugar in a big bowl and whisk for 15 seconds or so until combined. 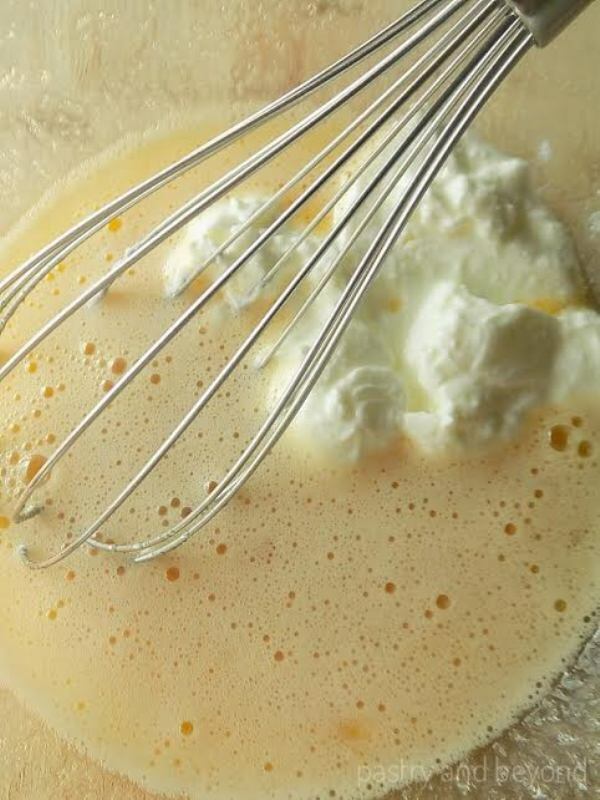 Add the olive oil, melted butter, vanilla and mix well until all totally combined. 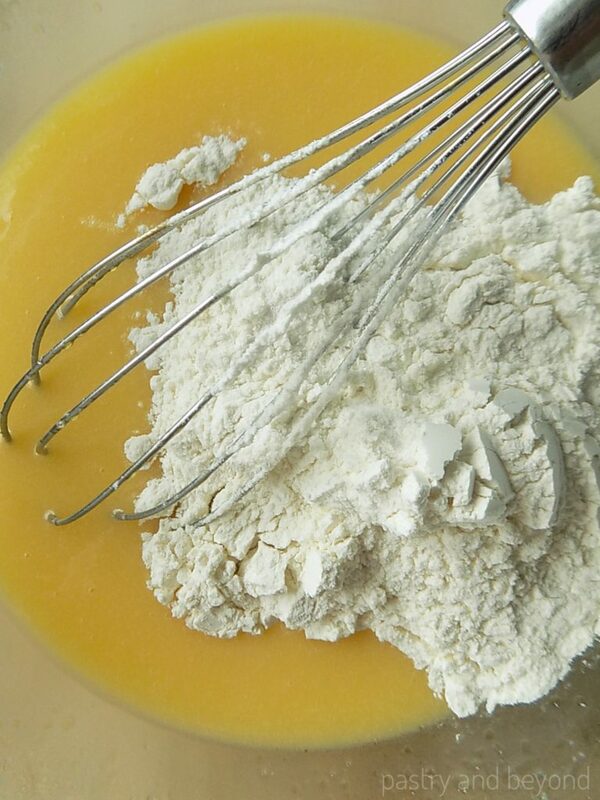 Finally add the flour to the wet mixture in 3 batches and mix until totally incorparated. Using a big ice cream scoop, take big pieces (even more than a big ice cream scoop can take-90 grams)of the dough and roll them into balls. Alternatively, you can divide the dough equally into 11 pieces and roll each into a ball. Then place them on the baking sheet. Leave enough space between the balls-about 2 inches(5cm). Bake for 20 minutes or until lightly golden brown. Remove the baking sheet from the oven. Let the cookies cool for 10 minutes on the baking sheet before transferring them to a wire rack to completely cool.